As we head into the home stretch of this series, we find our heroes facing "BETRAYAL!" Art duties for this issue are handled by the duo of Mike Vosburg and R. Villamonte and they do a good job balancing the action and helping the story move. 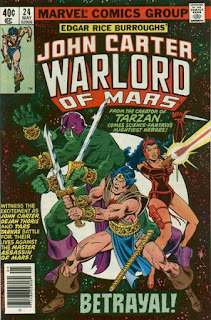 Some of the art choices are different from what has gone before-like the over-dramatic designs of Tal Modrin, as well as the first appearance of the "Hulk" Tars Tarkas that later comic book series would adapt. We also get Dejah's Barbarella outfit and well she wears it well. Otherwise it's a solid A for effort. 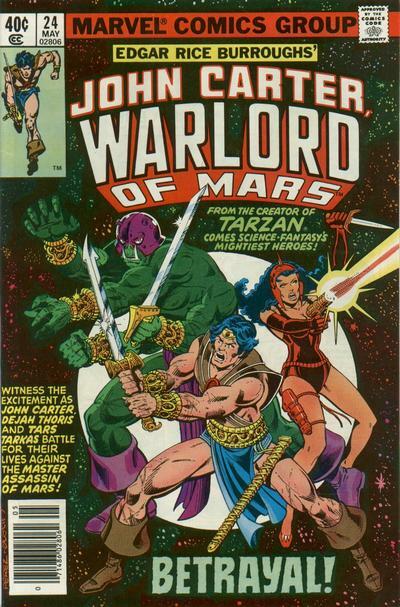 With four issue left to go (and three Giant Size Annuals) we're about done with our 1970s visit to Barsoom. Until next time faithful visitors, Kaor!